Ikea has made an incredibly forward-thinking move and has become the first major US retailer to start charging for plastic bags!! (Yes, I busted out with the double exclamation points--sadly, I can't remember the last time I've been so excited!) They just announced that beginning March 15th, you'll have to cough up 5 cents per bag to get those bulk tea candles and bargain wine glasses from storefront to car in plastic. Well, YOU won't have to, because bringing your own bags is soooo old news, right? Since debuting this program in Britain just last year, plastic bag reduction has been 95%, and they estimate that the 70 million bags used by U.S. customers will be cut in half in the first year. If you forget your bags, you'll be able to take home their "big blue bag" for a reduced rate of 59 cents. What a deal! The great thing is, it's only a matter of time before other retailers begin to follow suit. 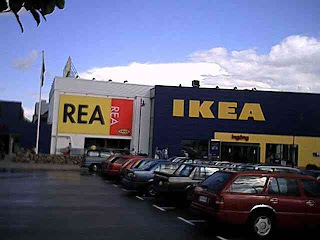 Visiting Ikea is never quite a pleasant experience, but I'm actually looking forward to my next trip to check out the operation. Read more about the announcement and what they're going to do with proceeds from the program on Treehugger. And from the mega-multinational to the locally owned... a shop owner in England declared February "Plastic Bag Free Month", and stopped giving out disposable bags to her customers. Speaking of making reusable bags stylish, another UK designer, Sarah Mower, complains that plastic bags should be banned, if nothing else, for their fashion violations. "To be perfectly shallow about it, on aesthetics alone, plastic carriers are unconscionable, and fashion ought to be pointing that out." This is a great read, on the Telegraph. Seriously, why bother fussing over finding the perfect outfit if you're going to ruin it with a gaggle of plastic bags as you shlepp around town? Answer: Keep the outfit, bag the plastic bag. Hmmm....This sure is a lot of anti-plastic bag momentum for one week. I smell a revolution, how about you?